There are authors and books that we all have good intentions of reading but sometimes, for reasons completely unknown to us, we never get to them. 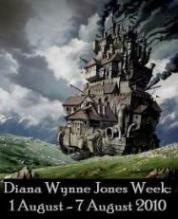 For me, I’ve always meant to read Howl’s Moving Castle by Diana Wynne Jones. The book has lingered on my long list of books for, well, let’s be honest, forever. I have no idea why I never picked it up. Have you read any of her books? If so, any recommendations? And, Jenny, if you’re out there, any suggestions? I AM out there – you’ve picked a really good selection already. If you’re reading The Dark Lord of Derkholm, the sequel’s also a lot of fun, Year of the Griffin. Also Witch Week, which I didn’t mention on any of my lists. It’s bleaker than some of Jones’s other books – it’s a bunch of kids at a boarding school, and they live in a world where people still get burned as witches. And someone leaves a note for the teacher saying SOMEONE IN 6A IS A WITCH. It’s exciting and suspenseful. Ooo, Witch Week sounds good. I’ll have to check and see what my library has.